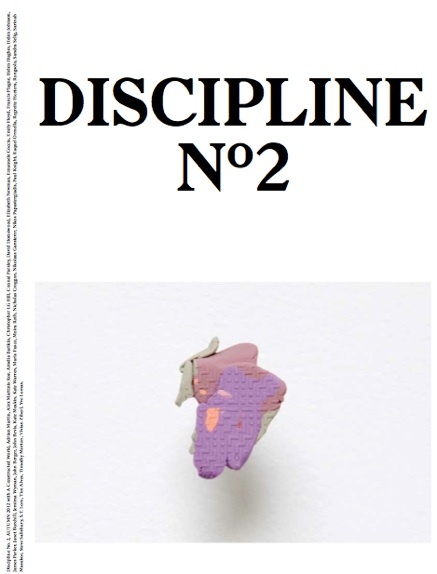 Nick Croggon and Helen Hughes are pleased to announce the launch of the second issue of their contemporary art journal, Discipline from 6–9pm on Friday 18 May 2012, at The Sporting Club Hotel in Brunswick. Discipline presents longer, research-based essays on contemporary Australian art alongside artist pages, and places such art within a global context. Issue 2 features a guest-edited section by Maria Fusco, editor of The Happy Hypocrite, author of The Mechanical Copula (Sternberg Press, 2010) and Director of Art Writing at Goldsmiths, UK. Discipline 2 is completely independent, and every aspect of the issue has been carefully crafted and curated: it is 176 pp, full colour, ad-free and has been beautifully designed by Amsterdam-based designers Annie Wu and Ziga Testen. ARTIST PAGES by A Constructed World, Elizabeth Newman, Sandra Selig, Kate Meakin, Rongsolo (Agatha Gothe-Snape and Brian Fuata), Paul Knight, Christopher LG Hill, and S.T. Lore. ESSAYS by Amelia Barikin on Ash Keating; Francis Plagne on Matt Hinkley; Helen Hughes on Callum Morton and Bianca Hester; Timothy Morton on Yukultji Napangati; Helen Johnson on Mira Gojak; David Homewood on Robert Rooney and Simon Klose; Kate Warren on Omer Fast; Adrian Martin on art criticism; Vivian Ziherl on Lip magazine (with Jemima Wyman, Alex Martinis Roe, Raquel Ormella, Regrette Etcetera and Emily Floyd); Tim Alves on Vernon Ah Kee; Sarinah Masukor on Vernon Ah Kee; Nikos Papastergiadis on Terry Smith; and James Parker on Simon Reynolds. TRANSLATION Emanuele Coccia by Connal Parsley. GUEST EDITED SECTION by Maria Fusco, featuring: Nikolaus Gansterer and Moira Roth, John Berger, Yve Lomax and John Bevis. SPECIAL POSTER INSERT by Janet Burchill.